The sun is a virtually infinite reservoir of renewable energy. As seen from the graph below, solar energy is by far the largest energy source available. The size of the solar energy reservoir is considerably larger than all other energy sources combined, including both renewable and non-renewable sources. It has been estimated that if only 2% of the solar energy hitting the earth’s surface each day was captured, all of humanity’s current energy needs would be met and even exceeded. The Size of Various Energy Reservoirs – Source: Perez et al. Given the vast amount of energy that can be sourced from the sun, many recent research and development efforts in renewable energy have focused on improving the ability to harvest, store and distribute solar energy. New installations of solar power continue to grow at an explosive rate as the price of harnessing solar power continues to drop. In 2013, the global solar power generating capacity increased by 26%, from 31 Gigawatts (GW) in 2012 to 39 GW in 2013. In the United States, solar power currently accounts of 1.13% of power generation capacity. Furthermore, the US Department of Energy (DOE) expects to add 1,510 MW of solar power capacity from finishing current solar projects by the end of 2015. The importance of solar power in the future of the energy industry prompts a closer look at 4 ways to utilize solar power. Photovoltaic (PV) modules, often referred to solar panels, are the most ubiquitous solar power harvesting technology. The ubiquitous nature of PV modules has prompted many to view the performance of PV modules as the main indicator of the overarching solar industry. Moreover, PV modules have been applied for residential and commercial power generation in buildings, such as Walmart’s recent solar installations, as well as for utility-scale solar power plants, with the largest PV generation facility being the 290 MW Agua Caliente plant in Yuma County, Arizona. PV modules generate electricity by energizing electrons inside their material system. PV modules are made from semiconductor materials, which have the ability to absorb sunlight and create electric energy. When sunlight is absorbed in a semiconductor, the optical energy of the light is transferred to the electrons inside the material. The energized electrons can then be extracted from the semiconductor into an electrical circuit, yielding electricity. A major reason why semiconductor materials are used for PV modules is their ability to separate electrons into high and low energy states, which are separated by an energy gap that is inherent to the material. When the sunlight is absorbed in the semiconductor, the absorbed energy promotes a low-energy electron to a high-energy electron, which then flows into the external circuit. Positively charged holes are also generated in this process and maintain charge balance in the overall system. As the amount of absorbed sunlight increases, so does the number of high-energy electrons, which then creates a flowing electric current. The energy difference between low-energy electrons and high-electrons, i.e. the size of the energy gap, determines the voltage output by the PV module. Solar thermal, also know concentrating solar power (CSP), is a lesser known method to extract solar power. Unlike PV modules, solar thermal is not applied commonly for residential or commercial building power generation. Solar thermal, however, has a tremendous potential to produce solar power on a utility scale. The 377MW Ivanpah solar plant in California’s Mojave Desert is the world’s largest solar energy facility. The $2.2 billion Bechtel built Ivanpah plant was a joint project of NRG, Google, and BrightSource Energy, and its 377 MW of solar power can power 140,000 American homes. In spite of its tremendous potential for utility scale application, solar thermal has recently faced increased skepticism due to its land-intensive nature, as well as environmental concerns relating to avian mortality. The energy harvesting process of CSP is inherently different from solar photovoltaics. In CSP, sunlight is directed using mirrors, and then concentrated at a single point. The concentrated optical energy is than used to boil water and generate high-energy steam. The high-energy steam then turns a turbine generator to produce electricity. Steam powered generators are a very established technology to generate electricity that is used by virtually all traditional power plants, including coal, natural gas and nuclear power plants. The inherent different difference between solar thermal and traditional power plants is that CSP uses renewable energy input to generate steam. A major challenges of solar photovoltaics and solar thermal energy generation is their inability to store energy effectively. This creates a demand-response issue, as the generated electricity needs to be consumed instantly. Plants, however, have the ability to store solar energy using photosynthesis. In the process of photosynthesis, plants take in Co2 and water to produce oxygen and glucose, a form of sugar. Photosynthesis has been extensively studied and the abundance of plants on the earth’s surface speaks for the scalability of natural photosynthesis. The products of the photosynthetic process of certain plants can then be further refined to create chemical fuels that have sufficient energy density for practical applications. This process is already being applied in making ethanol fuels from corn feedstock. Given the controversy of using corn to generate fuels, researchers are investigating additional crops that can be used for biofuel generation. Their aim is to find biofuel crops that grow quickly and efficiently, have a high energy density, and mitigate the food versus fuel conflict. In spite of the immense scale of biofuels, one of the main drawback of natural photosynthesis remains its inherently low efficiency. The energy conversion efficiency of natural photosynthesis is less than 0.5%, which is a major reason why many biofuel crops require significant refining steps to be converted into usable biofuels. Artificial photosynthesis aims to address the inherent flaw of natural photosynthesis by engineering a chemical scheme that converts sunlight into usable chemical fuels. Artificial photosynthesis intends to mimic the process of natural photosynthesis and to increase the energy conversion efficiency by replacing the biological agents in the natural scheme with solid state materials that drive chemical reactions to produce the desired fuels. The principal of artificial photosynthesis is based on electrochemistry. Many naturally occurring chemical reactions generate electricity with a distinct voltage. This phenomenon was the scientific basis used to engineer some of the world’s first battery systems. Like many phenomena in the chemical world, electrochemical reactions are reversible. This means that if one applies electricity with a certain voltage to a chemical system, one can initiate a chemical reaction that does not occur naturally. A common example of this concept is the production of aluminum: In its natural state, aluminum is found in various compounds, including aluminum oxide, which is more chemically stable than pure aluminum in nature. In this case, the natural electrochemical reaction is for oxygen to react with the pure aluminum to form aluminum oxide. The reverse reaction can be initiated by flowing electricity through the aluminum oxide to create pure aluminum. This process for making aluminum is known as the Hall-Heroult process and is still a common industrial practice today. In the case of artificial photosynthesis, the energy input used to generate the required electricity is solar energy. The optical solar energy is converted into electricity inside the material system using the same scientific principles as PV modules. Unlike PV modules, the electricity is not extracted into an external circuit but used to initiate chemical reactions at the surface of the material. The chemical reactions can be accelerated with certain catalyst materials, which increase the energy conversion of the overall system when engineered effectively. The premier DOE hub for artificial photosynthesis research is the Joint Center for Artificial Photosynthesis (JCAP), which is headquartered at the California Institute of Technology. Lawrence Berkeley National Laboratory is home of JCAP North, the second major location of the research hub. Since its inception in 2004, JCAP has designed and created various systems that have the ability to generate hydrogen via water splitting. The solar generated hydrogen is a usable chemical fuel that can be used for a variety of applications. Current artificial photosynthesis systems fabricated by National Renewable Energy Laboratory (NREL) display a solar hydrogen conversion efficiency of 12.4 %. The theoretical limit of solar-to-hydrogen generation has been estimated to be ~ 30%. JCAP ambitions, however, go far beyond water splitting. JCAP researchers are currently developing systems to convert CO2 and water into alcohols, such as methanol or ethanol, which are already being used as chemical fuels. A material system that uses solar energy to convert CO2 and water into chemical fuels with reasonable efficiency would represent true mastery of the chemistry underlying the photosynthetic process, and could have substantial implications for the energy industry. Humanity’s ability to harness solar power in an effective and economic manner has improved dramatically in the last decade. While solar photovoltaics, solar thermal and biofuels are already being used on industrial scales, the next generation of disruptive solar technologies may be based on artificial photosynthesis technology. Most likely, the future solar energy will include a combination of the 4 methods to meet different types of needs as well as innovative technologies that have not been discovered yet. Cross-posted from BERC Blog, published online by the Berkeley Energy & Resources Exchange, a network of UC Berkeley scholars and industry professionals. Great blog! You have shared the information that was not known to me. I found it interesting and you have helped me in updating my knowledge. Keep sharing! Extraordinary article, Santiago. As you have point by point in the 4 ways to deal with do daylight based essentialness, there is much potential for this ample wellspring of imperativeness. A little while later sun arranged power will be difficult to disregard, even by the oil associations. While the significant associations are so far pushing leases, my association is an uncommon hotspot for direct private daylight based power. Solar Energy is the biggest source by which we can save electricity. Most countries governments are taking initiatives from their end to expand the use of solar energy. Also, small countries should start using solar systems for commercial & household uses. Thanks for sharing such an informative article with us.Solar energy is one of the highly renewable energy providers and I am planning to purchase solar panel from Solar Tech Elec LLC which is one of the best Solar energy providers in USA .They will install the panel. Incredible article, Santiago. As you have point by point in the 4 approaches to do sunlight based vitality, there is much potential for this plentiful wellspring of vitality. Before long sun oriented power will be hard to overlook, even by the oil organizations. While the substantial organizations are as yet pushing leases, my organization is an extraordinary hotspot for moderate private sunlight based power. There are many uses of so everybody should use solar system. Awesome info. I think information like this seriously helps breach the gap between the science of solar and what the average person knows about it. Something which I’m trying to do over at Solar Panels Ontario (our company). I’m interested in seeing solar systems extend into outer space, perhaps something we might see in our lifetime. Thanks for the post, very informative. Solar energy is very abundant in nature and we should make its use and should save other non-reusable resources to generate electricity I really appreciate your effort in this post and you have benefited others and me by enhancing my knowledge. Also it is a cost effective method and pollution free. I think we should make this a big thing and should come together to adopt this technology of solar power plants so as to save money and our earth’s precious resources. There are lots of benefits of solar water pumps and really you can save more water for irrigation and landscaping as well. So, use this device as a water saver and power saver. Usually when I think of solar energy being used, I picture a bunch of solar panels that are laid out to capture and store UV rays. It’s interesting that there are so many different ways to use solar energy. 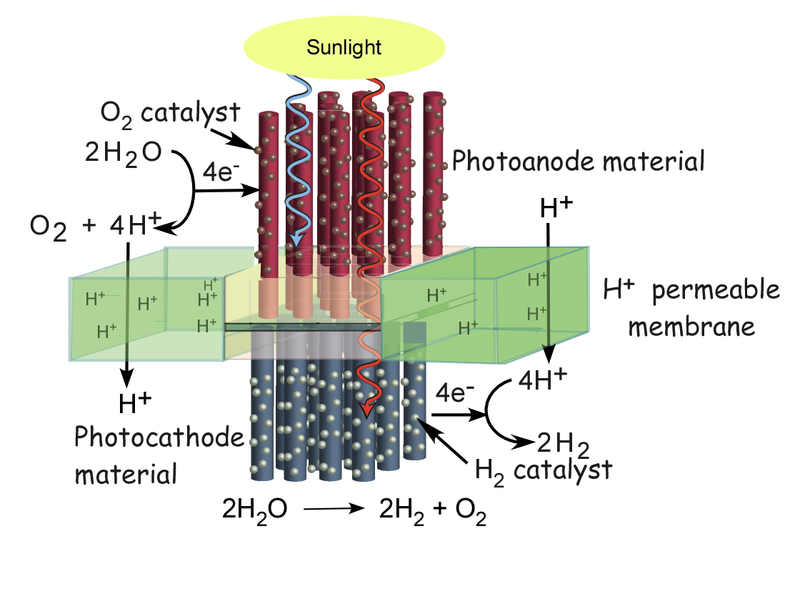 I can see why scientists would try to develop a form of artificial photosynthesis. It seems to work quite effectively for plants, so it makes sense to come up with a way to use that same concept into technology that we can use. What kind of a material system is used to convert the solar energy into electricity? It would be interesting to learn more about all of the materials that went into this technology to simulate how PV modules function. @Anthony, you’re going to need a whole lot more than a flat to build your own solar modules, better stick with a manufacturer. Nevertheless, solar PV is quickly becoming a huge market and turning towards utility scale solar PV more and more frequently. If I didn’t rent a private flat, I would definitely build my own solar panels. It would not only save me quite a lot of money, but it would be a great way to contribute to the well-being of the planet and it’s ecosystems. Our time is running out, and we all have to make changes as soon as possible if we want longer on this planet. Really useful information. Great work. You can learn a lot from this. Especially about our sun. How we can use its energy for a greater cause. Switching to solar can save more money and can also help the environment. Santiago, your article was very well written and informative as relate to the logic of solar-energy capture and conversion to use for human purposes. The sun, as the ultimate source of all energy available on Earth, will continue to provide its vast energy for an untold period of time. I get a kick out of “Save the Planet” bumper stickers and philosophy. This old rock will survive regardless of what we humans do to it. It always has and always will. Less is more, as concentrated solar power (CSP) can reasonably demonstrate. A superior goal of solar energy must be to capture and store the heat from the sun, not the electricity produced by inefficient PV panels. The billions of dollars being wasted in attempts to develop and deploy storage batteries for utility scale distribution of electricity would be better spent developing higher efficiency storage batteries for electric vehicles. CSP technologies are able to store the far more important heat that can be directed to electricity production when demanded. CSP will also provide the load demands on days of poor sunlight availability and during the night hours. Building and deploying CSP on a smaller and more efficient scale makes far more sense than doing so on a utility scale. I invite any and all questions as I will be ready very soon to disclose a small-scale CSP technology that will provide space heating, process heat, desalination, and electricity generation on a very affordable scale. Can we have your process in Africa, Nigeria to be precise. I have a large expanse of area land to donate. Just by reading this article, I was able to learn a lot about the sun and the ways to produce solar energy. Indeed, if we can fully harness the sun’s energy, then it would save a lot of money without endangering the health of many people. I think this is one of the safest ways of harnessing energy. Very Informative, nice. Recently I read an article that in Japan some of the major Solar Power Companies are taking up the project to install the solar system in the outer space of the earth. As the sun’s heat rays are more in the space, it will help them to generate more power. So if it works outs very well, then there will be an increase in the generation of solar power. Great post and very informative. I really appreciate your effort in this post and you have benefited others and me by enhancing my knowledge. Solar energy is very abundant in nature and we should make its use and should save other non-reusable resources to generate electricity. Also it is a cost effective method and pollution free. I have also read a nice blog about its benefits named “Be a part of a global revolution.” I think we should make this a big thing and should come together to adopt this technology of solar power plants so as to save money and our earth’s precious resources. Excellent article, Santiago. As you have detailed in the 4 ways to do solar energy, there is much potential for this abundant source of energy. Soon solar power will be difficult to ignore, even by the oil companies. The good news for homeowners is that while they wait for the utilities to get their act together, they can switch to solar and start saving money now. I’m proud to be able to help people go solar and save at the same time. While the large companies are still pushing leases, my company is a great source for affordable residential solar power. I’m just happy to be doing my part to make a difference. Nice blog, thanks, I’ll post it on twitter. I have to point out one problem, however. It’s a good idea to adjust comparisons of PV output for capacity factors. For example, most large coal- or nuclear-powered plants run at capacity factors of 80-90 percent. That means on average, over the course of a year, they produce at full output 80-90 percent of the time. By comparison, my home PV system has a capacity of 16 percent. In Germany, PV capacity factors are around 10 percent. That’s due to nighttime, clouds and off-angle sun positions. Let’s say that the world’s PV systems operate at a capacity factor of 20 percent, while coal plants operate at a capacity factor of 80 percent. That means PV output figures have to be 4 times as big as conventional to produce the same power over the course of a year. So the world PV capacity of 39 GW produces the same amount of GW hours as fewer than 10 conventional 1-GW power plants. That’s not so much. I like to look at it this way. My home PV system is rates at 2.72 KW, and produces about 3700 KWH during a typical year. The recently closed San Onofre nuclear plant produced 2.2 GW at a capacity of 80 percent (conservatively). Both sources are carbon-free. How many of my home PV systems would be necessary to replace all the electricity that was being produced at San Onofre (assuming we could solve the intermittency problem)? Answer: more than 4 million. We have our work cut out for us.